Receive up to BM$34 by attending this module. BM$ can be used to offset future course fee payments. Worship Dynamics II steps up the intensity and flair from the previous module to lift you to new heights of worship. Exploring more impactful syncopated rhythms, you will garner a wider repertoire of rhythm variations for further song applications. The in-class group synergistic exercises paired to devotional reflection will instill a deep connection between you, your Cajon, and God’s heartbeat. Our thematic journey, THE ROAD TO VICTORY (Part II), promises to empower you to stand boldly against enemy forces, just as the Israelites withstood the might of Egypt with God on their side. 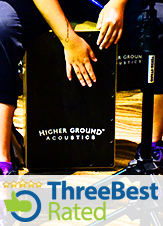 Come away with renewed vigor to play triumphantly on the cajon as you claim your victories. Thematic Devotion: THE ROAD TO VICTORY (Part II): Claim the redeeming power of God in your lives as we mirror the Israelite march to freedom in the Exodus story. I am a Music/Church pastor; I'd like to include a subsidy for my members. This step-by-step course is designed for total beginners who have absolutely no prior knowledge in music or the Cajon. Individuals who attended other beginner courses but are still unable to play confidently and effectively are advised to join this Primer Module. What you are going to learn here is going to be fun, powerful and practical for worship application.